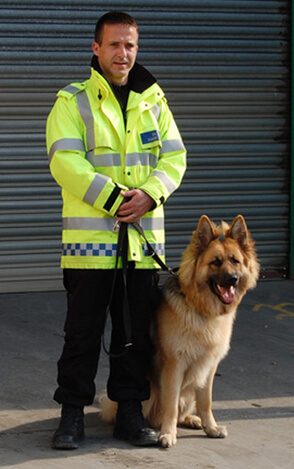 While security guards, Dog-patrols and door supervisors are superb ways to help keep your business or venue free from trouble and on the alert for any anti-social behaviour, for certain security tasks and particularly for apprehending potential troublemakers, you can do no wrong with hiring an effective and intimidating guard dog. We supply fully trained and obedient guard dogs Leeds and beyond – covering Bradford and the wider West Yorkshire region – meaning that you can depend upon us for a smart, alert and best of all loyal canine to help protect your assets and business when there isn’t necessarily a patrol or dedicated support available to you. Our dogs are great at picking up on intruders and deterring even the most determined of unwelcome visitors – dogs are fantastic not only at scaring off unwanted guests but are also superb at sniffing out unwelcome substances and can pick up on potentially harmful behaviour far ahead of human senses. We supply loyal, happy and intelligent guard dogs Leeds and beyond for any business or event purposes – and you can be assured of a cared-for canine that will show you and your business the respect and protection that it deserves on a regular We supply loyal, happy and intelligent guard dogs Leeds and beyond for any business or event purposes – and you can be assured of a cared-for canine that will show you and your business the respect and protection that it deserves on a regular basis.